12-27-13: We received the lamp shades today and they are just perfect and our 82 year old mother loves them! Thank you so much and you are a wonderful company!! 5-28-13: Dear Jim, My husband, Bill Winter, asked that I forward this photo (see Uno shades) to you along with his sincere thanks for your help with a recent order. He purchased this wicker shade for the floor lamp that he restored and then discovered he needed a UNO thread - which you quickly and efficiently put in the mail to him as an additional courtesy. He thought you might like to see the finished project! 4-24-13: Jim, I came in this past Friday on the way to mountains. I have seen your store for a few years and always wanted to stop. When I told my husband he turned around. Now, he is not a shopper so the experience was nice for him, but he was ready to get to our destination. For me, I was in heaven. We talked for a while and you were so gracious with your time. I love your store. In Charlotte I have never been happy with the selections. So, I was so thrilled with your store. I told my girlfriends in the mountains and told them were to find you. Some want to drive up with me. I do want to come back without my husband. :) I would also like to bring in two antique chandeliers that I would like your guidance and support on. One has a broken piece I need to replace, if possible. And the other is from the 50's which my father purchased. It is the only thing I have of his, he passed when I was four years old. I did paint it at one time, and I would like your expertise to understand if or should the paint can be removed. I would also like to shop! I did see a few things I am very interested in. I know you are retired, I am not. So, I am wondering if there are some Saturdays when you are in the shop? If so I could come up and meet with you and shop. Let me know. Again, it was a thrill to spend time with you and to wonder through your store. Thank you for such a lovely experience. I hope to have a few more. 4-17-13: Jim, The two 9 x 16 x 12 black, side pleated lamp shades I ordered arrived yesterday. They were amazingly well packaged and were a day early. I wanted to let you know they look great, and I'm very pleased with them. They look fantastic and are well made! I'll give you a call when I'm ready for the next shade order! Thanks for your super customer service and suggestions! This shade had just arrived safely - and I am absolutely delighted with it. Sincere thanks for your help, and for the excellence of your service. 3-23-13: The shade looks incredible. Thank you all so much. I really appreciate the hard work you put into it. My girlfriend loves it. Thank you again. I was sitting here this morning looking at my new shades and wanted to let you know how happy we are with our purchase! I was a bit anxious buying them over the internet but with the lack of local lamp dealers in our area I had no choice. My purchase is perfect…our lamps are back to beautiful. The swan lamp arrived today and I couldn’t be happier. I will send you a photo of the pair as soon as possible. Thank you, and again the lamps look great together, it’s as if they were meant to be together. You guys are geniuses........the shade fits perfectly, and the extra harp you enclosed does the job. It continues to amaze me how you can fit lamps flawlessly at such a great distance. Many, many thanks.....I'm delighted with the results. 1-24-13: Mr. Hoyle: My Stiffel lamp shade arrived today and it's just perfect. Thank you so much! I'm so glad I found your website! 12-5-12: Jim, I just received the lamp shade and it is very impressive. Thank you for getting it to me before Friday, I really appreciate it. Happy Holidays to you. - C. B. From Tokyo city... M. Y. 10-30-12: Just wanted to let you know that I received the shades today and I'm delighted. Thank you. My new shades just arrived and I couldn't be happier. They were packaged carefully and they look beautiful in my living room. I'm getting ready to order another shade. Thanks again for your wonderful products. 7-9-12: I can't recall that I thanked you for the two lamp shades you constructed for me recently (this spring). The black fabric shade for my husband's office added much to the decor and physically fit the lamp perfectly, just as you said you thought it would. The custom metal bouillotte shade is incredible. What a spectacular lamp it completed. I could not be more pleased. Again your company has saved my day and I thank you wholeheartedly. 5-11-12: Hi, My lamps arrived safe and sound yesterday, Thursday, and they look great. I just want to thank all of you for the fine workmanship and service that you provided. We had been debating whether to recover or replace and I’m glad that I discovered your company and that we decided to get them recovered since we were having trouble finding the size that we wanted. They look better now than when we originally installed them in 1978. Thanks again and it was a pleasure doing business with you. 5-1-12: Good morning Jim, just wanted to let you know the lamps arrived this morning and are absolutely beautiful! I was so amazed at how fast they shipped and more importantly, the wonderful way that they were wrapped and boxed. I will be saving those wonderful containers and cloth like wrapping, I haven't seen anything like that before and my father worked in a local box factory for years. As soon as I get some other projects out of the way I will be contacting you to find a shade for my Remington table lamp. I may just have to order another floor lamp too as I have decided the torchiere with the gallery shade might not make it into my bedroom, it is looking quite at home standing proud in my living room. These are really nice lamps Jim, they look great! In the photos they appeared larger but in person they are perfectly proportioned for my 1950's contemporary home, not too tall, not too bulky, I love them. Anyone would be foolish to buy an antique lamp off of ebay like I almost did and still have to recondition/rewire them, let alone find the perfect shades for them. Besides the awful condition most are in the prices and shipping is far too high and who knows how well they would have been packed. Your prices are just right, I will be recommending you to anyone looking for nice lamps or shades, you have made me very happy this morning. FedEx just delivered my new lamp shade (A30102). I just wanted to let you know how absolutely delighted I am with it. It is a perfect fit and compliments the lamp beautifully. My grandmother (1899-1979) from whom I inherited the lamp would love it just as much as I do! My thanks to you and Janie for your help in finding just the right shade for me. 3-2-12: Thanks Jim! Customer service, packaging and shipment gets a 5 star rating. It's good to know there are "Mom and Pop" shops still out there that care about their customers. Your business made my wife very happy...and that's not as easy to do! 11-28-11: Hi Jim. I received the shades for my mom's lamps and LOVE THEM. Thank you so much. A. W. H., R.N., Ed. D.
Hello, Jim, Many thanks to you, Janie, Janie and everyone else at the Lamp and Shade Outlet for getting me both of my lamp shades in a timely fashion. They are beautiful! 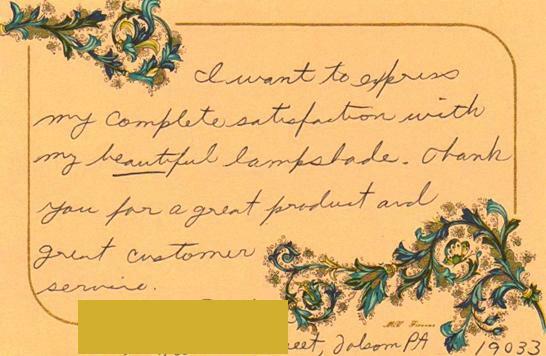 Your quality, craftsmanship, and customer service are indeed top-notch. Wishing you all a wonderful holiday. 10-28-11: Jim - Received shade in excellent condition. You did a wonderful job. 10-27-11: Jim, My hand painted glass globe arrived yesterday and I’m very pleased with it. 10-17-11: I want to express my complete satisfaction with my beautiful lampshade. Thank you for a great product and great customer service. Jim, Just wanted to let you know the lamp base arrived yesterday, Monday Aug. 8, in perfect condition. Could not believe how well it was packed. Now I have to find something to do with those many yards of packing fabric. I hate throwing things away, and will surely have to find some use for all of that. 6-1-11: Just wanted to let you all know that I received the lamp base yesterday ... it was waiting on my porch when I got home from work. I love, love, love it! I've been looking for almost 2 years now for the right lamp base for a tiffany shade that I bought at an antique shop - was a great deal because it had no base. Anyway, just wanted to let you know how happy I am. Also, what a great job you did in packing it. Nice and secure. Thanks again! C.A. 5-12-11: I am so much more than impressed I can't think of what to say. What a beautiful job she's done, please thank her profusely for me. Thank you all for this great service you provide and the terrific customer service, Noreen. The lamp looks great! With a little effort I was able to hang it over our kitchen table. We love it. Thanks again for your work. 3-4-11: The two lamp shades I ordered just 5 days ago have arrived and they are exactly as described on the web site and by the lady taking my order over the phone. We have been looking for replacement shades for some 30-40 year old Stiffel lamps for several years and could not find anything we liked until now. They look great! The lady helping me on the phone went out of her way to measure and describe the shades to ensure I knew what I was ordering (I knew next to nothing about fabrics, and knew nothing about harps, etc.). It was a pleasure doing business with you and I have already started sharing your contact information with friends and family. We won't be replacing shades often, but I will start with you whenever the need arises. Thank you - E.A.W. Jr.
2-10-11: Jim - Please excuse the delay in letting you know the status of the shade. Right during its arrival, I was in the midst of moving to San Antonio and considered that the shade was in the best condition for travel as it was - in the box/un-opened. Only a week or so ago we we in a position to set up those special items (including the lamp/shade) to a usable condition. That said, upon opening the box/setting it up, it became readily apparent that several panels were replaced and that extra effort was taken to make it right - I was most impressed! Recognize that the process to get to this point took some time, but I'm pleased to know that you/your team stands behind your word/workmanship - that has great value and exhibits great customer service. Thank you Jim - this is a special family heirloom that you brought back into use and daily appreciation. 10-23-10: I just want to thank you for the beautiful lamps. You would have thought it was Christmas time when they arrived. We could not get the boxes open faster enough for being so anxious and excited. There was paper all over the dinning room floor and we did not care; any other time it would have been a problem. All phone calls had to cease. They are simply beautiful. They are gorgeous. They remind me of the lamps my mother had before Katrina. She had the porcelain lamps with the naked ladies with the gold trim and the shades were similar to the ones we received from you. Everybody is happy; the house is happy. We thank you for your time and cooperation. Thanks so much. We will pass you websites on to other family members and friends. THANKS!!!!!!!!!!!!! Just a quick message to let you know that the conversion work is finished and that the blue dragonfly lamp now graces the study. As you can see, it looks well set among other lead light lamps. 9-21-10: Dear Mr. Hoyle, Some time ago a friend of mine accidentally broke a globe on one of a set of matched lamps I own. He contacted your organization to see what could be done. Two days ago I received the results of your work. With the exception of a VERY slight variation in the shape of the globe, over which you have no control, the globe you copied is virtually identical to the original. No one to whom I have shown the lamps can even see any difference at all in the globes. I cannot say enough about the artwork. The colors are identical to the original, both when the light under the globe is off AND when it is on. Even the brush strokes on the copy appear to go in the correct direction. Needless to say, the graphic detail on the copy is identical to the original. Kudos to your artist. He or she is in the wrong line of work. They could make as an art forger! You people have to be the best in your business. 7-29-10: Hello. I am delighted with the "little hat" shade and how it complements this lamp. I also appreciate the tips on "polychroming" and was able to achieve that effect with this lamp. The flash was necessary because it is such a dark room, but it doesn't do the subtle aspects of the shade or the coloring any favors. Still, I wanted to share it with you. B.M. - Louisburg, N. C.
6-21-10: Dear Jim, Thank you very much for your help here and on the phone earlier. Unfortunately I can’t invest $100 in this lamp which I bought for $10, lovely as it is, since I am not working right now and need to make my bank account last. But I wanted to say that I love your website with the environmental messages, and page about recycled packaging materials and the ocean plastic gyre. You are a man after my own heart and I encourage you to keep it up. Too many people go along oblivious to all these problems. I really appreciate your actions! Your business looks wonderful and I will come back in the future for any lamp need when my fiscal conditions improve. 3-24-10: Hi Jim, The Shades arrived last week. They are perfect and the new harps put them at the correct height. Thanks for the great service. - J. L.
2-25-10: I received your shades and must write to tell you how happy I am with them! I’ve been looking for replacement shades for quite a while now, and yours are of superior quality and match my lamps perfectly. 2-9-10: Jim et al, The package arrived intact today. Great lamp shade, and it's perfect for the lamp and room. I will definitely tell people about you. 12-31-09: Yvonne, Just a note to let you know the lamp arrived in at Don & Isabel's door steps in Eufaula, OK, and it was a huge hit and a very Merry Christmas! It would not of happened without your GREAT customer service. 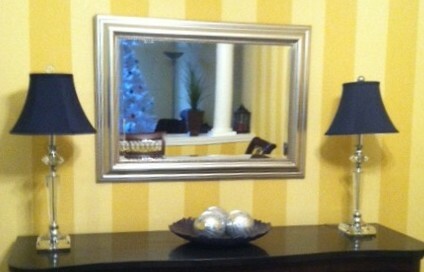 12-7-09: I received the repaired lamp shades a couple of weeks ago. Nice work. We are very satisfied. Sorry it took so long to get back to you with this thanks. - T.M. 11-25-09: The lamp shades are beautiful. I could not be any happier. They allow plenty of light flow and best of all they fit the old floor lamps perfect, and very reasonably priced. Thank you so much! I even got lamp shades in time for Thanksgiving. - S.O. 11-24-09: Hello! I'm writing to say how much I like the two new clip-on off-white string lamp shades. They look beautiful on the old white porcelain wall sconces in my powder room. Thanks! - C.M. 10-12-09: Hi, Received my lamp shade. It is beautiful. I don't have the floor lamp with me as it is in the garage in the condo I'm purchasing so I'm going to try and go over after work one evening and see how the shade looks on my floor lamp. Thanks so much and have a good week. Best regards, N.
9-28-09: Dear Jim, We are so happy with our new lamp that we had to send this picture to you. Hopefully it will open for you. Thank you so much for your prompt and courteous service. We will be referring you and your business to friends and family. Thank you again - E. and L. W.
8-18-09: Jim and all, Thank you for a good job; we love the swag/hanging lamp.8-15-09: Dear Jim, Thanks for the good advice you gave me regarding the selection of lamp shades for my two Stiffel lamps. My wife and I are very happy with the lamp shades. They are really beautiful. And, I am most satisfied with your service. Your web site is outstanding. It was easy to browse and fascinating to see such a selection. 7-31-09: The lamp shade arrived and it is very perfect. P.J. 7-27-09: Received the lamp shade. It's perfect! Thanks again for your advice. Appreciate the recyclable packing material too. Best Regards, E.
5-15-09: Thank you for your recommendation of the glass torchiere lamp shade for my Dad's lamp. Yes, it is different than the original glass shade but it is a good different and I thank you for helping me through the selection process. I guess you need to really thank Gracie. If it were not for her I may have thought you were just another lamp store! Have a great weekend. I am still contemplating a lamp shade but I am unsure of covering up the glass. K.A. 5-13-09: I received my lamp yesterday and I LOVE it! Thank you so much for the excellent customer service and the great lamp! - N.A. 4-29-09:Hi Jim, the box was sitting outside the door at midnight. Thank you so much for repairing my lampshade!!! Respectfully, L. C.
2-21-09:Hi Jim, Absolutely fantastic. You folks are artisans in the true sense of the word. It is not often I am thrilled that I live in the age of the internet and computers, but in this case I would never have found Hoyle Lamps! I will get the $ off to you on Monday and you should have them Tuesday. Keep me posted with shipping date, tracking number, etc. Also, don’t forget the little desk lamp – and the ruined pieces of the shade I sent you and the glass. Our youngest has a friend who is a metal worker and he wants to fiddle around with the pieces. Although this “new” lamp shade is so spectacular, I cannot imagine that I ever really loved the broken one I sent you. 1-30-09: Also, we wanted to take a moment & let you know how very much we appreciate ALL that YOU folks at LAMP SHADE OUTLET have done in putting back together a special treasure for us by bringing back a little more delightful light into our home & lives once again!!! You're da best!!! Sincerely, respectfully, & gratefully, M. & L. C. Lake Isabella, Calif.
1-8-09: My daughter, M. S., and her sister and their families, got together and ordered a "swag" lamp for my living room for Christmas. I am really enjoying it. I especially like the two-way switch. I can have a soft light just to have some light in the room or a bright light to read by. 10-8-08: Hi Jim: Received my lamp shade today and I am so very pleased. It's beautiful and was well worth the time and effort spent on the Internet to find you and your lovely lamp shades. Thanks again and if I hear of anyone that needs your service, I will recommend you highly. B. 7-29-08: Thank you so much for the replacement torchiere lamp shade (dish type). We had broken ours, and I wasn't sure the new one would work, fit, be the right color, size, and be a reasonable price. 5-6-08:Dear Mr. Hoyle: The lampshades I ordered arrived a short time ago. I have removed my 30 yr. old shades, polished my "cut glass" lamps, crowned them with the new shades, and my whole bedroom looks brand new. "cut glass" lamps, crowned them with the new shades, and my whole bedroom looks brand new. Thank you so much for your website. I can't tell you how long I have been looking for those exact lamp shades. The packing was great and, Fed-Ex actually brought them to my front door. The billing came yesterday so I am all right with the world. Gorgeous lamp! Arrived quickly, well-packaged & in great condition. Thank you! VERY NICE PICTURE, ONE OF MOST HONEST SELLERS I'VE BOUGHT FROM!!!! Prompt and courteous, with excellent communication and follow-up. 11-27-06: R. C. and I just opened the lamp box tonight and put the lamp together....She just screamed (literally screamed) with excitement. It took us two hours and twenty minutes to decide where to put it and how it should be sitting. I'm going to have a strong drink before turning in tonight. She is SOOOOOOOOO happy with this purchase. If you need anyone to put any positive comments about your company on your website just let me know... J.R. - Durham, N.C.
1-31-07: (phone call) I just wanted to call to let you know we received the lamps and they are just perfect. I appreciate your help in changing the heights and the stone accents are beautiful. We will definitely come see you again. - L.W. Lancaster, S.C.
2-17-07: I am so glad my sister and I found your beautiful store. We will most definitely be coming back. B.H. Cherryville, N.C.
3-29-07: Dear Jim, I received your beautiful lamp yesterday and I wanted to be certain you knew how delighted I was with you, your son AND your lovely lamp. I will be looking for some more of those. If you ever get in anything that you think is very extra special, please let me know - in the 6 way. I have a few more dark corners! You were a pleasure with whom to work and I thank you, Jim. Best regards, B.M. 5-16-07: Jim: I finally got pictures of the finished product. We are very pleased with the lamp you made for us. It serves it's purpose great and we have had a number of nice comments on it. R. & C. H.
10-12-07: Jim, received shade today, looks great, arrived in one piece. Thank you, Mel - Colorado!